To Begin to make our Tim Tam Slams you will need to put two Tim Tams onto long Skewers and place them in the freezer to set. You need to be careful when Pushing the skewer through the Tim Tam that you try and push it through the cream layer and keep it pretty central. Don’t worry if the biscuit starts to split at the side just push it back together and place on a tray and into the freezer. Next you will need to make the lovely thick batter. Place all of the dry ingredients into a bowl and add the cracked egg and milk. Whisk together till thick and smooth. Pour in the coffee shot (if using) and whisk through. Allow the batter to sit for 10-15 minutes to let the flour bloom. 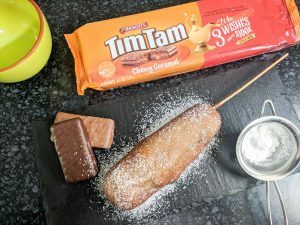 Once you are ready to construct your Tim Tams you need to make sure that your oil is up to temperature so you can immediately fry the Tim Tams once they are coated with the batter. Remove the Tim Tams from the freezer and holding the skewer at an angle hold it over the bowl of batter and carefully spoon the batter over the chocolate. 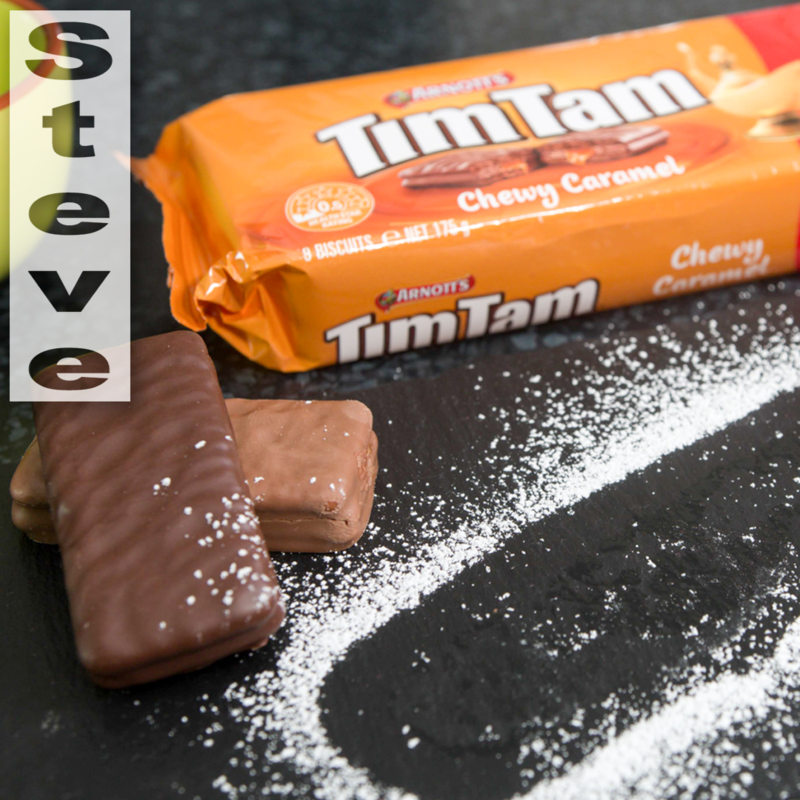 Turn the Tim Tams and continue to cover the whole biscuit with a coating of batter. Lift upright and give it a gentle shake to smooth out the batter before carefully lowering into the hot fat. Don’t let go straight away allow the hot fat to start to cook the batter before letting go. Cook for about 3 minutes or until golden brown all over. Sometimes the skewers will turn themselves but sometimes you will have to give them a helping hand to get an even colour on the Tim Tams. Remove from the fat once they are cooked and place on to some paper towel to drain. Sprinkle with powdered sugar and serve. Be careful as they will be extremely hot to start with. Enjoy!!! !